For optimum organization of post-production easyDCP offers special bundles. These bundles are reduced in price, ideal for initial equipment. The content of each easyDCP bundle is chosen to suit the needs of DCP/IMF packages mastering and additional quality control. The easyDCP Bundles include the DCP/IMF package mastering, the generation of encrypted and unencrypted DCPs, and creating KDMs or DKDMs. In addition the easyDCP player is included to simplify testing and quality assurance. Depending on the bundle type it allows also playback of encrypted DCPs uncrypted DCP/IMF packages and export to other formats. 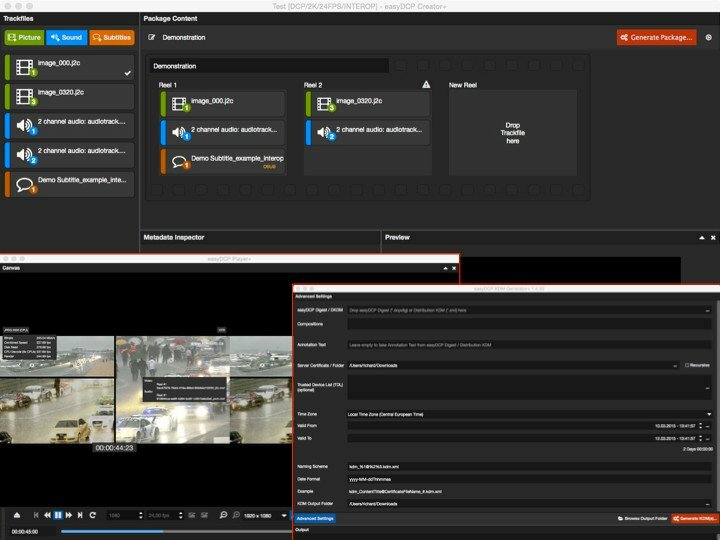 With easyDCP Creator+ and easyDCP Player+ as Bundle 2 you can save € 500.00 excl. VAT.